Artificial Intelligence (AI) is a half-century-old idea but investors across the globe have warmed up to it only now. While the world's largest tech companies such as Google parent Alphabet, Facebook, Microsoft and IBM are investing heavily in the field, hordes of other investors have also jumped on the bandwagon in the hope that AI will be the next big idea that will drive the tech industry. Reports suggest that close to 200 AI startups got funded in the US in the past 18 months. The trend has caught up in India, too, with entrepreneurs developing chat bots to tools that help in visual search and medical diagnosis, and investors are stepping in to back the ideas. 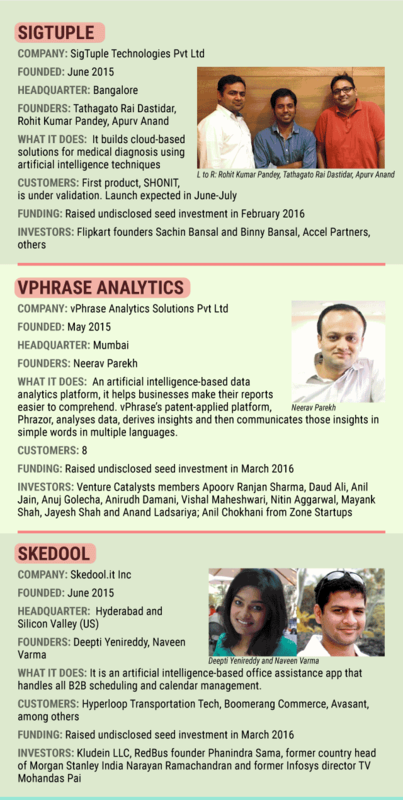 Here are six Indian AI startups that raised funds in the past six months.